Daguerreotype of Young Abraham Lincoln: "The only other known, and hitherto earliest, daguerreotype of Lincoln, Meserve #1, in the possession of the Library of Congress, was a gift of Robert Todd Lincoln to Frederick Hill Meserve. Meserve reported that 'Lincoln believed it was made in Washington in 1848'." I seriously doubt Robert Todd Lincoln donated this photo. The picture on the right in no way is Lincoln. Just because they have the same hair doesn't make them the same person. I agree. Not Lincoln. Facial structure isn't right. 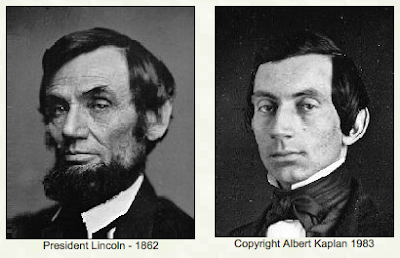 The young guy's nose is more aquiline than President Lincoln. That was also a common hairstyle; nothing unique.